Knowles, led Adi through a description of his life as a Christian, and his story as a teacher, community worker and political activist. 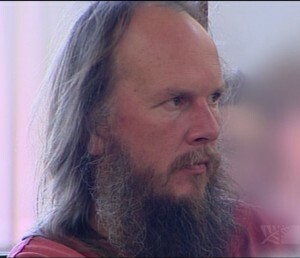 Adrian James Leason is 44 years old, married with 7 children, presently living in Otaki. He made three of the banners used in the Waihopai ploughshares action. Mr Knowles then took him through those parts of his character and background which led him to making those signs and using them as part of an action to deflate the Waihopai dome. Adi has been a Christian for 37 years (with a clear recollection of inviting Jesus into his heart aged 7 while attending Sunday school). He says though that he never really deepened his faith until aged 16 or 17, when he was involved with a local youth house – where he got a clear appreciation of the difficulties facing some young people. As a result of his experiences he gained a primary teaching qualification while active with Wellington “Youth for Christ”. He began teaching in 1987. After a time he joined a group called “Youth with a Mission” and travelled through asia. After recovering from a serious bout of Malaria Adi began work in a refugee camp where he was exposed to a lot of “economic refugees” from Vietnam who’d been battered and scarred by the long war in that country. He returned to teaching in Wellington and got re-connected with Youth for Christ. He married Shelley, and they became active in a community centre. Out of this they moved into a Council High-rise among a community of need, and began working directly with the urban poor. He worked with the Wellington Association of Tenants, and succesfully took up capaigns against the sale of public housing, and against an increase in rents. By this point in his testimony Adi is referring to “our family” as an organic unit, and he and Shelley have three children. After seven years in the high-rise Adi’s family travels to Thailand to live and work in a slum community in Bangkok. He is there for 9/11, and for the invasion of Afghanistan and Iraq. In possibly his most compelling testimony he spoke of seeing the preparation for war: the spending of Billions upon Billions of dollars on the machinery of war and the preparation for killing while the community he lived in was suffering the blight of poverty that money could have assisted. He spoke directly to the jury at this point about preparation for war being like a train coming inexorably down the tracks, towards a school bus which had broken down on the crossing “and even though the citizens of world in their millions, and the media, and the agencies, were yelling out to the train, warning it about the school bus ahead, and asking it to stop…the train sped up and rolled straight over that school bus. In 2004 Adi’s family, broke, returns to Aotearoa, and Adi works at conventional teaching jobs again, now with four children and another on the way. They work to buy a farm at Otaki, and see and see and hear about the unfolding wars in Afghanistan and Iraq through the internet and media. He feels proud that the New Zealand government refuses to commit combat troops to Iraq, but is painfully aware from the work of Nicky Hager about the spy base at Waihopai, and the vital role it plays in war-making. Baghdad is bombed into rubble. Through this period he is continuing in his life of faith, and getting to know the Catholic Worker community in Aotearoa. He meets Peter Murnane and Sam Land. Adi has become deeply concerned by the failure of legitimate protest, and he believes that secrecy and unaccountability by security agencies and military machines is one reason for this failure in democracy. 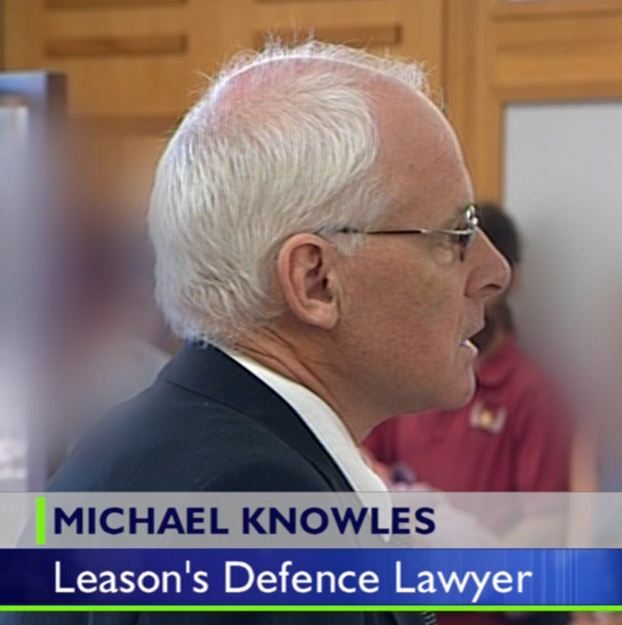 Mike Knowles then starts taking Adi through his understanding of the function and impact of Waihopai spy base. Adi says a lot of his knowledge is based on Nicky Hager’s book “Secret Powers”. He spells out the global nature of the Echelon network, and begins to detail incidents of commercial and political espionage that Echelon is responsible for, and that Waihopai was probably involved in. 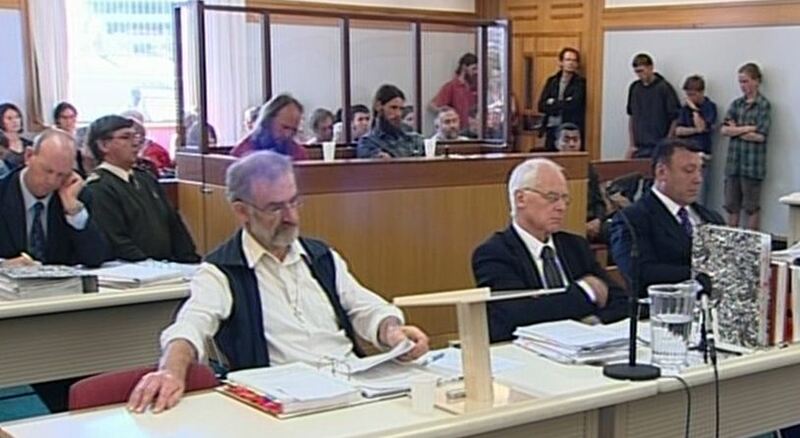 It is when Adi begins to discuss spying on UN Security Council members in 2002 that the prosecution Counsel raises his first objection – which is resolved in the defence’s favour – just minutes before the power in central Wellington goes out and Court is finished for the day. I felt privileged to be in Wellington District Court to hear the testimony in this case. The jury was rivetted by the testimony they heard, and the love, compassion and integrity of Adi Leason shone through. It’s Wednesday morning now, and I’m getting ready to go back and hear the rest of Adi’s story, and the beginning of Peter Murnanes. Thanks for writing about the trial especially the key statements from Peter & Adi over the past three days. I’m a Wellington supporter but can’t attend the court hearing due to urgent work committment this week. It’s inspiring for me to be able to read and catch up with the updates. There’s so little reporting in the mainstream media. Kia kaha! Great coverage. Thanks a lot Bryan. Previous Previous post: Day One Goes Off!